Still, while foreclosures make up a significant part of the real estate market in many areas of U.S., one metro area will vary wildly from another when you focus in on local markets. Thus emerges a tale of two cities, this one from the pages of ZipRealty’s market data. The information focuses on San Francisco and Las Vegas, since both are world famous American destinations: iconic, historic. But while the Las Vegas real estate market shows impact from foreclosures with two black eyes and a broken leg, San Francisco is only experiencing a couple of bumps and scrapes. 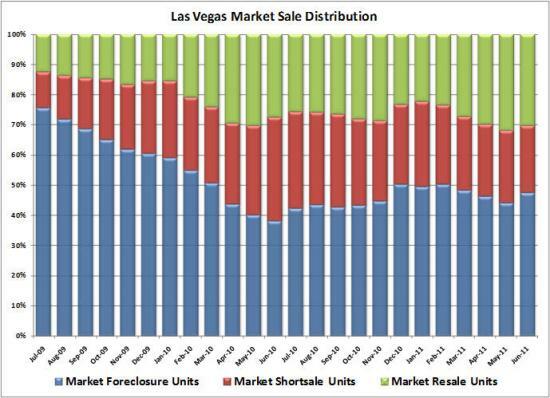 Here we see that foreclosures alone have made up a large portion of Las Vegas real estate sales for the past two years. And, when you combine foreclosure with short sales, you have a majority. You can see gradual improvement as the number of market-priced resales increases year-over-year, but overall, Sin City’s been badly punished. 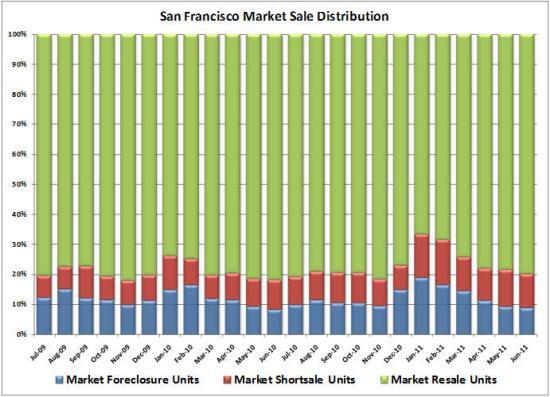 Plenty of green: For two years, the real estate market in San Francisco shows no month in which foreclosure alone, nor foreclosures together with short sales, outnumbered market resales. Market-priced units, despite the fact that San Francisco boasts some of the most expensive real estate in the country, have continued to sell at well over half the rate of their distressed-property counter parts. Of course, people could argue that the beating has yet to rain down on SF. Option-ARM mortgages that reset in the next two to five years at higher interest rates could push up the short sale or foreclosure numbers. Still, for now, the lesson here is this: In understanding the American real estate market, we must learn that individual city markets are as unique as individual cities themselves.